LEVERAGING YOUR SERVICE-PROFIT CHAIN Leveraging Corporate Performance Through Linking and Satisfying Your Employees and Customers. Satisfied Employees. Satisfied Customers. Customer Retention. Tunnel vision: they focus solely on transactions, view the lifetime value of a customer relationship as the arithmetic sum of the transactions they conducts with that client. They don't really seek to build relationships with the client, thus diminishing synergies that come into play when enduring relationships are built and nurtured. They forfeit the opportunities for gaining referrals, generating word of mouth, cross-selling, and building barriers to competitive encroachment. Skewed cultural bias: they reward employees on transactional basis and are unwilling to change their internal model to one that rewards people for building and maintaining relationships. It is estimated that two-thirds of customers who defect do so because of poor service. In order for customer service to drive profits, every link in your service-profit chain – employee capability, job satisfaction, productivity, employee loyalty and customer satisfaction – must be strong. Delivering top quality service must be brought to the top of your company's needs hierarchy as one can draw a straight line between superior service and your sustainable profit growth. To achieve success, you must make superior service second nature of your organization. The service-profit chain is a powerful phenomenon that stresses the importance of people – both employees and customers – and how linking them can leverage corporate performance. 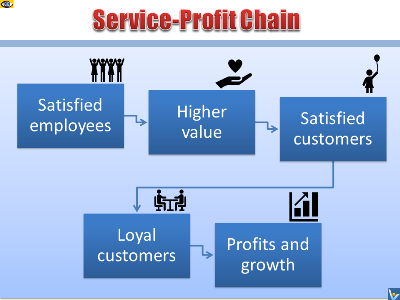 The service-profit chain is an equation that establishes the relationship between corporate policies, employee satisfaction, value creation, customer loyalty, and profitability. Unleashing the power of the service-profit chain will improve your performance. Moving from a focus on transactions to a focus on customer relationships delivers sustainable financial advantages. Your must look beyond the arithmetic value of individual transactions to all the ways you can serve the customer to capture and develop lasting relationships.